WASHINGTON, DC, December 9, 2009 (ENS) – In the first federal lawsuit challenging an industrial wind energy project on environmental grounds, a federal court ruled Tuesday that a wind farm under construction in Greenbrier County, West Virginia would kill and injure endangered Indiana bats in violation of the Endangered Species Act. The defendant company Invenergy, and its subsidiary company Beech Ridge Energy, will not be permitted to construct the rest of the planned wind turbines until an Incidental Take Permit has been obtained under the Endangered Species Act, Judge Titus ruled. Beech Ridge Energy plans to construct and operate 122 wind turbines along 23 miles of Appalachian mountain ridgelines in Greenbrier County. At the time of trial, foundations for 67 turbines had been poured, turbine deliveries had begun, and transmission lines were being strung. The Beech Ridge Project is expected to cost over $300 million to build and will produce 186 megawatts of electricity, equivalent to the amount of electricity consumed by 50,000 West Virginia households in a typical year. The project is projected to operate for a minimum of 20 years. “As this nation embraces renewable energy which all of the plaintiffs support, it is critical that such projects be undertaken consistent with federal law to ensure that our rush to develop a green energy future doesn’t jeopardize imperiled species,” said D.J. Schubert, a wildlife biologist with the Animal Welfare Institute, one of the plaintiff groups. “In this decision, the court sends an unequivocal message that the ‘green energy’ label does not exempt wind power from compliance with federal laws protecting wildlife and the environment,” observed William Eubanks, an attorney with the law firm Meyer, Glitzenstein & Crystal, which represented plaintiffs in this case. 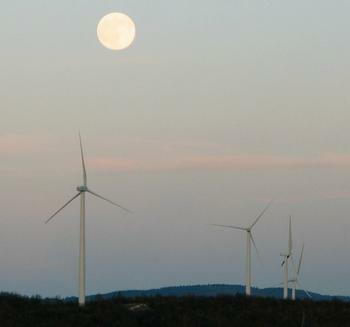 “We do not oppose responsible development of renewable energy projects be they wind farms, solar farms, or tidal energy projects but there must be independent federal regulation of these project to avoid unintentional consequences to protected species,” said John Stroud, spokesman for Mountain Communities for Responsible Energy, the other plaintiff organization. Dave Cowan, an enthusiastic spelunker who has explored many of West Virginia’s caves, was the other plaintiff in the case. “This court has made clear to Beech Ridge and its parent company, Invenergy, that the ESA has teeth, that the Indiana bat will be harmed by this project, and that these companies don’t get a free pass to violate the ESA,” he said. Accordingly, the court held “that the only avenue available to Defendants to resolve the self-imposed plight in which they now find themselves is to do belatedly that which they should have done long ago: apply for a permit” under the Endangered Species Act. Defendant Invenergy is the fifth largest wind developer in the United States, with an aggregate wind-energy generating capacity of nearly 2,000 megawatts. The company has wind farms in development in Quebec, on tribal land in California and on several sites in Illinois.